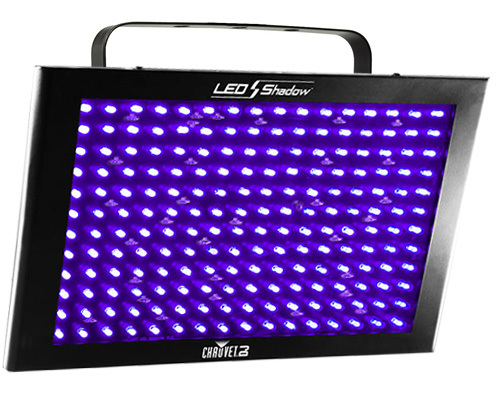 The LED Shadow DMX blacklight combines high portability with the low power consumption and longevity of LEDs. 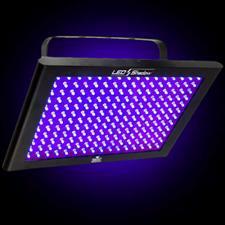 It is fitted with 192 ultra violet LEDs averaging 100,000 hours of operation. The diodes are enclosed in a sleek, 2.5" thin plastic and aluminum panel. Total weight is less than 5 lbs. The Shadow offers three channels of DMX control dimming and strobing capabilities as well as the activation of preset programs. All functions can also be triggered in stand-alone mode via dipswitches. LED Shadow incorporates two sturdy brackets (for clamp and wall mount) and one extra power output to daisy chain units. For a more complete mobile show, this distinctive blacklight can also be linked to the LED Techno Strobe featuring all white strobing LEDs and the LED Techno Strobe RGB with full color mixing. All three fixtures are capable of performing chasing patterns. Size: 14" x 9.75" x 6.5"